Hi! I recently bought an interesting Swedish magazine from 1965, Bildjournalen, with the Beatles and the Who on the front page. 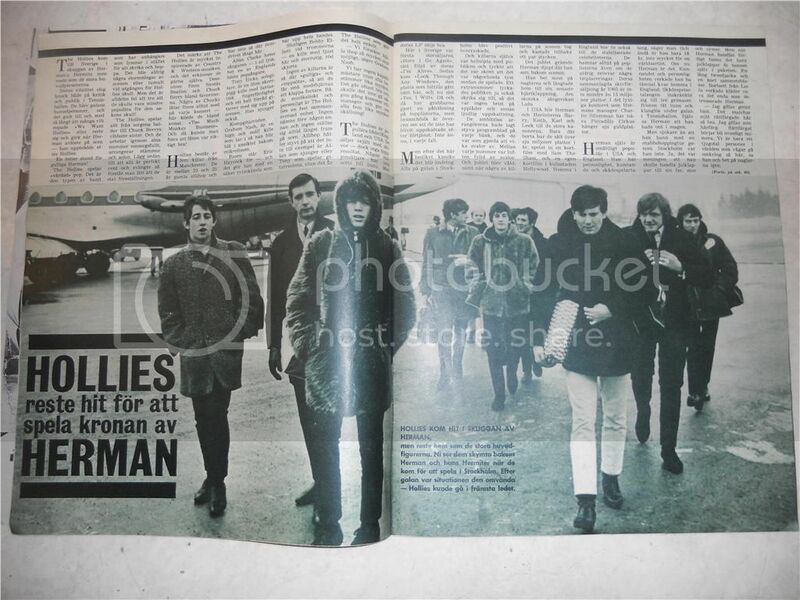 I translated this article about the Hollies, written after their first visit to Sweden! THE HOLLIES travelled here to take the crown from HERMAN. The Hollies came to Sweden in the shadow of Herman’s Hermits, but went home as the great winners. Their vitality knocked the socks off both the critics and the public in Tennishallen. They became the main attraction at the show, even to the extent that many people shouted –“We want the Hollies”, or stood up and walked out when Herman entered the stage – he was on after the Hollies. A bitter moment for cute Herman! The Hollies play “proper” pop music. They are the kind of band that has got followers who are listening instead of screaming and jumping. There is never any charging of the stage or any disturbance at the doors after a Hollies concert. But it’s wrong to think that they are any the less popular! The Hollies play anything from sad ballads to the wildest songs of Chuck Berry. And they prepare their songs thoroughly, arranging harmonies and solos. And add to that, that every note is perfectly clear and that it swings, then it’s easy to understand that they stole the show. You can tell that the Hollies are very inspired by Country & Western music, and they gladly admit it. And of course the Beatles and Chuck Berry are among their favorites. At least one of Chuck’s songs is always included in every concert – here they did “Too Much Monkey Business”. And they made you realize that the song is really good! The Hollies consists of five lads from Manchester. They are between 23 and 25 years old, and they don’t have extremely long hair. Allan Clarke is the name of the singer – one of England’s best pop singers. Tony Hicks, solo guitar, is a little guy, alert as a squirrel, with an amazing dexterity, who has a whole bunch of guitars with him on stage. He sings too. Graham Nash, rhythm guitar, is a calm and nice bloke, who sings himself blue in the face behind the microphone. Eric Haydock takes care of the bass - with a confident sense of rhythm that is the backbeat of the band. Finally Bobby Elliott at the drums – a guy with fair hair and a checkered shirt. None of the guys is so cute or really sweet that he awakes motherly feelings or makes girl’s hearts beat faster. Both musically and personally, the Hollies are a tight unit. No one is mentioned before the other, and no one is always standing at the front of the stage. They all make the point that it’s not Allan who is singing or Tony who performs the guitar solos, but it’s simply the Hollies who do. We try to keep together as much as possible, says Graham Nash. We haven’t got a bandmaster, everyone has an equal say. This works most of the time, and if it doesn’t, our manager comes along and gives all five of us an equal telling off. The Hollies are popular both in England and in America. Their records are selling well – but they don’t get any top results. No million seller has come up yet. But their LP is selling well. Here in Sweden “Here I Go Again” was first, closely followed by their “I’m Alive”. Then came “Look Through Any Window”, the record that has sold best here, and now “Yes I Will”. Now and then the lads have made a visit to the top lists, but people in the music business agree that they haven’t got the appreciation that they deserve. Not yet anyway. But after this visit that may change. Everybody at the concert in Stockholm was pleasantly surprised. And the guys themselves were very happy with the audience, and thought that it was good that they were relatively quiet while they were playing. But the crowd managed to get them to play an extra number, by screaming, and there were also lots of applause and other noisy appreciation. The ambitious promoters had put programme sheets on each seat, and they were perfect for making swallow paper airplanes. Between each number, the air was full of swallows. And the public roared when some of the lads on stage threw a couple of them back! That roar hit Herman deep, where he was sitting behind the stage. He probably bit his nails, and longed to get home to his latest “heartbeat”, the Scottish singer Lulu. In the US, Herman and the Hermits Barry, Keith, Karl and Derek are among the big shots. In the US only, they have sold seven million records this year, made a short film with Sam the Sham, and a short film of their own in Hollywood. Home in England, they also belong to the stabilized celebritys. They always end up in the pop lists, even if they never take any top spots. In 1965 they have sold no less than 13 million records! In the luxurious office of Herman’s manager Charlie Silverman, close to Piccadilly Circus hangs seven gold records. Herman himself is extremely popular in the US and in England. He’s got personality, skill and acting ability they say. And yet he is only 19 years old. Not much for a world artist. After this follows many negative remarks about poor Herman (Peter Noon), that I don’t feel like translating. There’s no need, and after all, this is about the Hollies. The Hollies came here in the shadow of Herman, but went home as the main characters. You can see them behind Herman and his Hermits, when they came to play in Stockholm. After the show the situation was the opposite – the Hollies could walk up front. Thanks to Susan (snowflake ) for checking my translation.